Until the 17th century, wine was served straight from the bottle; then it gradually became customary to pour it into a special serving bottle or jug before carrying it to the table. In addition to being more decorous, the new procedure had a practical advantage: if the wine was poured slowly and gently into the serving jug, all of the sediment was left behind in the bottle. This process was known as 'canting' , and as early as 1710 the vessel that received the wine was being referred to in advertisements as a 'decanter'. Originally it was fortified wine such as port, Madeira and sherry that was served in a decanter, a practice extended only much later to whisky and other spirits. Another popular drink was claret, which had a different meaning in the 18th century. Today it refers to dark red wines, but formerly it was a general term for the light red wines of Bordeaux, which Englishmen had been drinking with their meals since the Middle Ages (when this area was ruled by England). 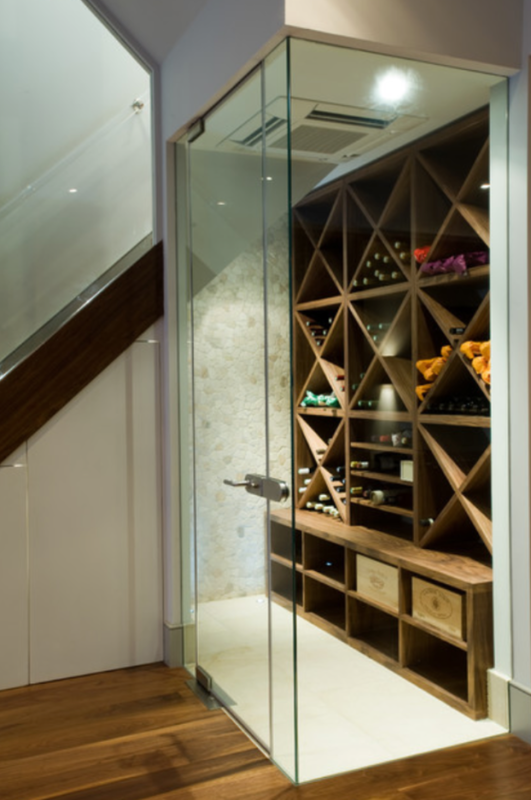 Premium cellarage services provide a peerless storage environment, offering everything your fine wine needs when laid down to mature - making it safer, finer and ultimately worth more. From bonded warehousing to online photographic records of your collection - ideal for potential buyers - services are wide ranging and prices do fluctuate so worth investigating further. The treatment care is dependent on the type of timber used and the finish. This basic guide will help your custom piece last more than a lifetime. Sourced from North America, grey elm has a rich grain that makes it a fascinating and beautiful timber, especially when used for inlays. 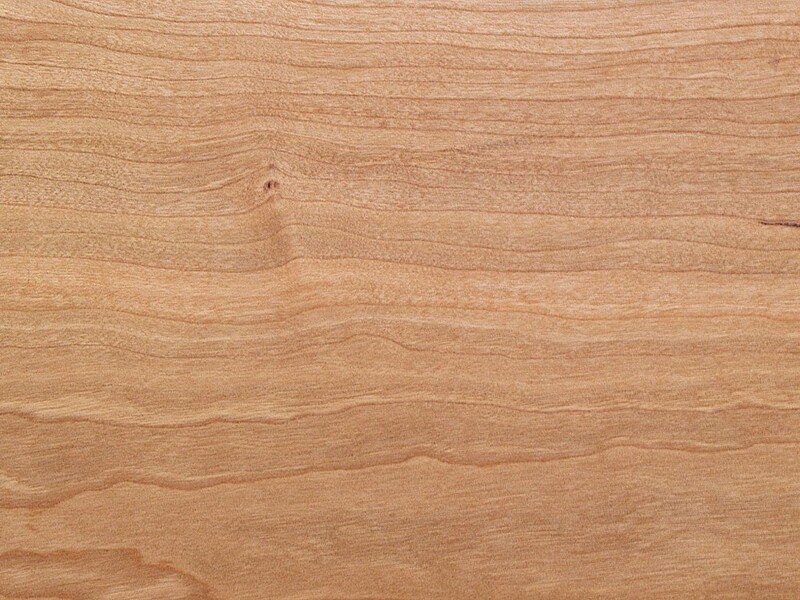 Elm is hard wearing with lacquered finishes naturally darkening over time. Stained versions of the woods described above, usually in ash or oak, adding a little more protection from spillages. Staining also adds a greater level of colour control between timber batches. Finish: unless otherwise specified, our wood is usually finished in a durable clear matt lacquer. This provides an easy to care for durable finish that doesn't compromise the natural beauty of the wood grain. 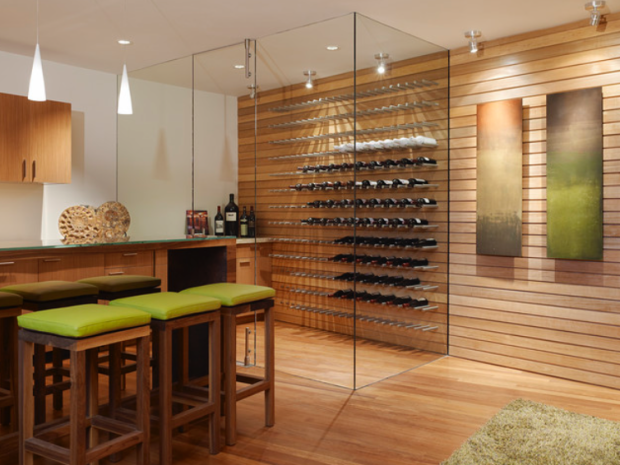 Care: solid woods may expand and shrink with differences in temperature and humidity. Take care not to place your furniture next to radiators or anywhere subject to excessive changes in temperature or moisture content. We recommend that all kitchenware and beverages should be placed on mats and any spillages should be wiped away immediately. Finish: applied by hand. the pre-oilded finish enhances the open grained appearance of the wood giving it a slightly more rustic,matt finish. We use an Eco friendly Linseed based oil. Care: despite having already been pre-oiled, we recommend that you apply an additional two coats of oil within 48 hours of taking delivery of the table. We would also recommend that you oil the table surface on a six month to yearly basis depending on its usage. Take care not to over-oil the table. We will give more advise during the wood selection process. Please note that unless specified by a client, we manufacture entirely out of solid wood and it should always be remembered that the wood should not be exposed directly to excessive heat or moisture. For instance, do not place immediately adjacent to radiators and in the event of any spillages, wipe up all liquids as soon as possible before the liquid has the opportunity to soak into the wood. Again we will advise which woods to use dependent on site visit. Cleaning: to clean, simply wipe down with a soft, barely damp cloth to remove any dust. In the case of stubborn marks, a solution of mild detergent such as washing up liquid should be used on the cloth. Avoid the use of scourers or bleaches. In the event of severe spillages and stains the surface can be re-finished. However it is recommended that you consult our customer services department. All the woods we use is responsibly sourced natural timbers. Why do I need to decant wine? Should you decant it or just serve it up straight out of the bottle? Decanters not only look elegant but placing a wine in a decanter 'wakes up' the wine so that it reveals its full personality. Decanting either separates oxygenation of a young or tannic wine in order to release its aromas, or enables the liquid from the sediment for a vintage wine. Decanting also presents the wine or whisky in a glass or crystal receptacle which highlights the natural colours. Berry Bros. & Rudd set out to find the most frequently asked questions about wine, before enlisting the expertise of their own team to answer them. Here their Wine Education Specialist, Anne McHale MW, explains why certain wine styles benefit from being decanted and the best way to go about it. See more videos from BBR by visiting their YouTube Page. Did you know that during the 18th century, when England was at war with France during the Napoleonic Wars, England imported young port wine from their Portuguese allies. When the wine was shipped, brandy was added to help keep it in good condition. This led to Britain's adoption of Port as their wine of choice. The Claret Jug is the popular name of The Golf Champion Trophy, the winner's trophy in The Open Championship, one of the four major championships in the sport of golf. The awarding of The Claret Jug dates from 1872, when a new trophy was needed after Young Tom Morris had won the original Championship Belt outright in 1870 by winning the Championship three years in a row. See our recommended range of decanters from The Silver Company. 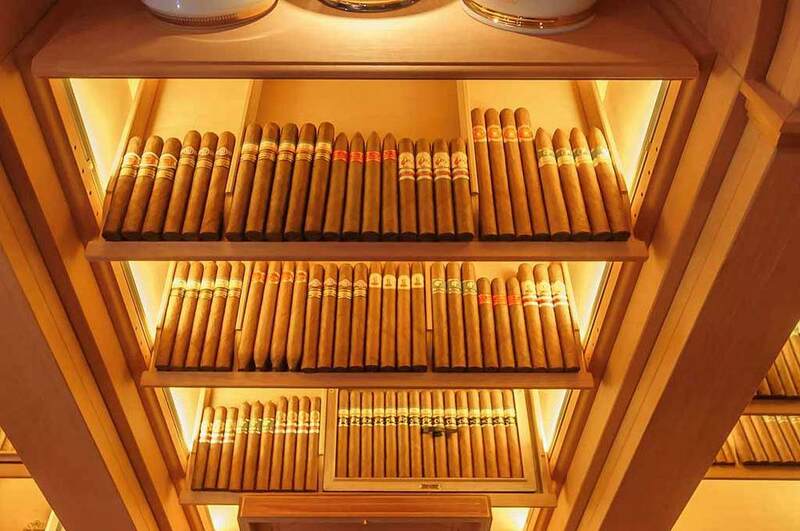 Stunning examples of bespoke and standard cabinet humidors. Superbly crafted, with exquisite marquetry and exotic wood inlays. 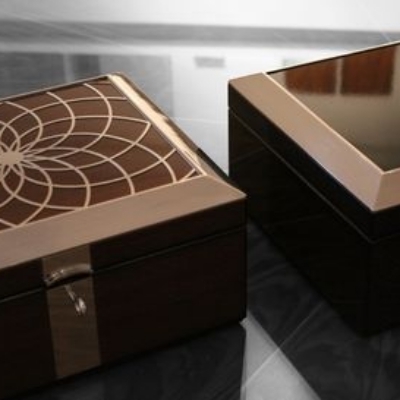 It's hard to find a flaw when buying bespoke humidors made to your own secification. Whatever you put in them will simply come alive. 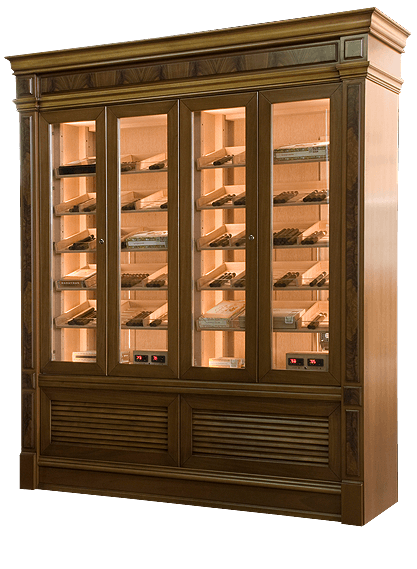 If your budget will not stretch to 100% bespoke why not consider a beautifully made free standing humidor cabinet made by Europe's leading manufacturer. 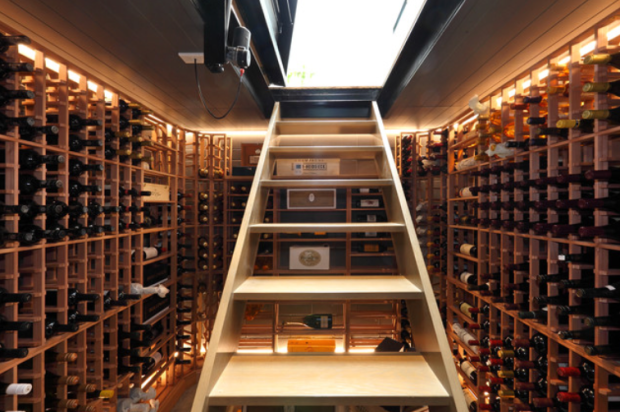 Some great examples of in home wine cellars from around the world. For more information on cigar venues in London download the Simply Cigars Cigar Venue App. Covered up smoking areas are awesome! With heated lamps and deep armchairs, it’s pretty much as far as you can get from standing out in the cold. You could even meet your perfect woman here as they run special events that introduce the ladies to the cigars. Definitely order a Tobacco Road cocktail with rum and tobacco liqueur to go with your smoke. They’re well equipped for a long session here; with heaters, fine accessories, blankets and cushions under the awning, all of which should keep you warm as you smoke. They have books on cigars too, so you can turn up in your best tweed and make like you’ve been smoking them forever. If you really want to splash some cash, you can try one of the rarest cigars currently on the market here – in the Cohiba Behike range. Their cigar terrace is actually dedicated to cigar smokers after 5pm, so leave the Marlborough Reds out of it. Revelling in plaids and tartans, with antlers and boars’ heads on blood-red walls, Boisdale relishes its Scottish heritage – no wonder it’s a top choice for sipping a few drams. But there’s more to this fun-loving venue than malt whisky – owner, bon viveur and self-appointed ‘laird’ Ranald MacDonald also has an eye for good food from his homeland. Dunkeld smoked salmon, Buccleuch chicken, well-aged Aberdeenshire beef, haggis and more besides appear on a wholesome and well-crafted menu that plays it straight – expect top-notch steaks with “excellent chips”, venison, Hebridean crab and Shetland mussels with linguine, plus some serious wines to boot. Otherwise, it’s all about entertainment and “good convivial company”, with the bonus of live jazz, cocktails in the upstairs bar and a terrace for those who enjoy premium cigars. Click here to hear more from Ranald MacDonald or read their own magazine Boisdale Life. The second floor restaurant is decorated in the instantly recognisable Boisdale signature look of lacquer red and dark green walls hung with eclectic and original artwork. It is here that one can find the whisky bar, a 12 metre long ‘amber wall of liquid gold’ that holds over 1,000 bottles of malt whisky. One floor below is the art deco-inspired Oyster Bar & Grill which benefits from an awning-covered heated cigar terrace complete with members-only area. Four private dining rooms are available, accommodating from 12 to 40 guests. The Corinthia Hotel is nothing if not impressive. Two restaurants, a handful of glorious suites and a beautifully glamorous interior, it’s the haunt of choice for celebrities wanting to avoid the limelight that staying in Mayfair invariably draws. Now, if there happen to be any cigar lovers amongst the Corinthia’s a-list guests – we’re not sure where regular guest Will.I.Am stands – you’ll be able to find them in the hotel’s garden lounge. If anyone is wondering how to make a courtyard cosy, point them in this direction. Designed in collaboration with David Collins Studio (who else? ), the outdoor space is a fusion of calming cream and terracotta and hand-made mosaics trailing to the roof. An outdoor fireplace, complete with armchairs and a canopy could place you in someone’s lounge. 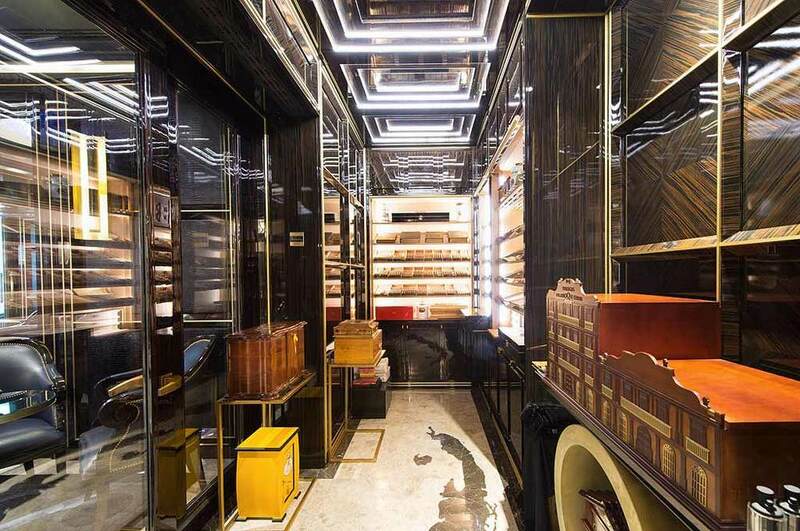 The key to it all however is the Corinthia’s bespoke humidor. Dark, luxurious and suffused with tobacco, the space houses a good number of fine cigars, including the rare Partagas Sublime and 109. Complimented with a range of 15 different whiskies from the terrarium bar, there’s nowhere better to spend a warm, lazy evening. Over in Knightsbridge, the Bulgari is all about extravagance. Dinner at hotel restaurant Rivea illustrates that well enough. Well, what else would you expect from an Italian jeweller? We were half expecting bejewelled serpents crawling along the walls. Fortunately what we found was a very decent martini at Il Bar and one of the most exclusive cigar lounges in London. Edward Sahakian is a cigar legend, his eponymous emporium a pilgrimage for true idolisers of rare Havanas. Curated by Mike Choi, a contender for best UK cigar sommelier, there are examples in the humidor that you simply can’t find anywhere else, including the fabled Davidoff 80 Aniversario. Once you’ve made your selection, whatever it may be, there’s no need to head outside, with one of London’s very few cigar lounges. 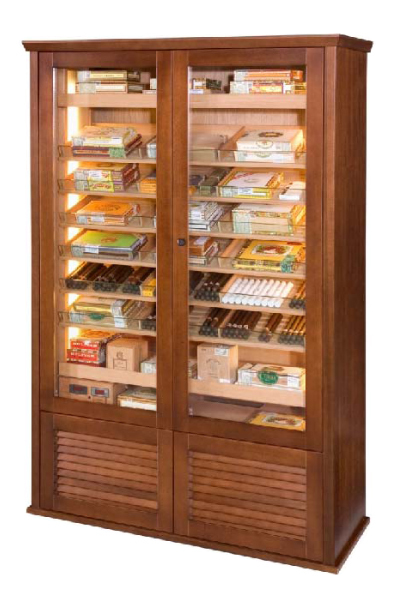 Amateurs beware however; this is a humidor dedicated to the consummate connoisseur. Leather arm chairs, a roaring fireplace and a luxuriously carpeted floor, the Wellesley’s Cigar Terrace certainly continues the town house feel of the main hotel, especially with the occasional flash of gold. Yet being bordered by a hedge and iron fence certainly add a touch of eclecticism to proceedings. While one of the smaller cigar lounges, its size creates a sense of energetic intimacy, as full of conversation as curling wreaths of smoke. Its cigar collection too is more refined than many of the others, yet manages to balance range with exclusivity. They have the usual Montecristos and Cohibas, but also some rare, limited edition Bolivars set in reserve for the true connoisseurs. Match with one of the bar’s classic cocktails and before you know it you can find yourself spending an entire evening in rapt indulgence. What goes better with cigars than whisky? Cognac. Or at least that’s what DUKES Hotel seems to think. Sequestered just off St. James, the hotel certainly had its fair share of epicurean guests over the years; it was at DUKES’ bar that Ian Fleming created the famous Vesper martini – shaken not stirred, of course. Yet more than anything, it’s a haven which, if it wasn’t a minute from Piccadilly, you’d assume was in some quiet West London neighbourhood. It’s a sort of sophisticated solitude, one which they have built into the very fabric of their cigar and cognac garden. With its curtains, mirrors, cushions and candles, if there wasn’t a breeze you could quite easily be in someone’s sitting room. But they’d be unlikely to have such a fine selection of cigars, or let you smoke them there and then. Complete with a range of cognacs to fit, if you’re unsure about the best pairings (we’re more used to whisky) feel free to ask. A more relaxed experience than some cigar lounges, why not follow a relaxed smoke with a martini? Everything about the May Fair bespeaks glamour, be it the restaurant, bar or various suites. However, when it comes to their cigar room, they’ve really outdone themselves. The stunning outdoor space balances cosy with elegant, wood and wicker meeting mood lighting befitting a Manhattan loft bar. This setting is everything you could ever want to elevate smoking a cigar to an experiential level. 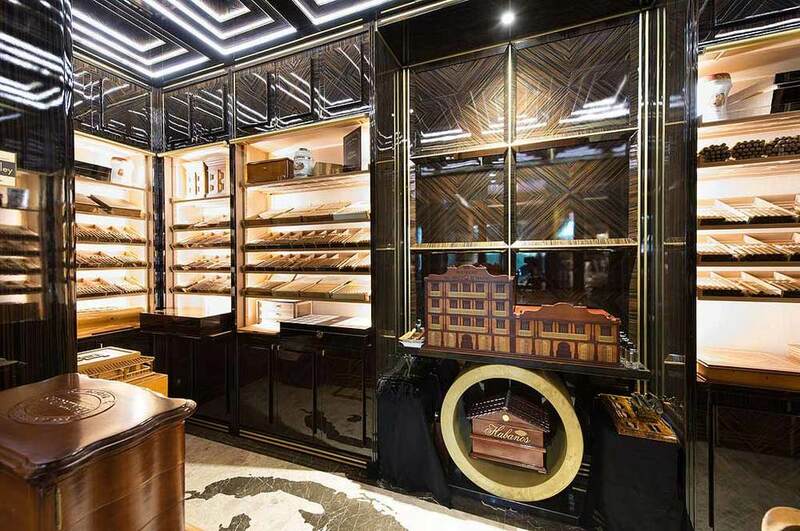 Sample a range of stunning cigar-inspired cocktails or indulge in the Cigar Room’s Rare and Fine Collection and select an Armagnac, cognac or exquisite whisky to go with your cigar of choice. And oh what a choice there is. Cohiba, Montecristo, Partagas, Trinidad, Bolivar, the list goes on and on. All the finest cigars are represented, complete with some exceptionally rare examples. The sheer range begs extended tasting sessions, making the monthly cigar and spirit masterclasses a necessity for experienced cigar enthusiasts and newcomers alike. Guests are invited to make their choice from the sizeable collection of Cuban and pre-Castro cigars in The Garden Room’s celebrated walk-in humidor, and take a seat in exclusive surroundings, perhaps with a Cognac from the bar’s extensive selection, which includes bottles from as far back as 1770. 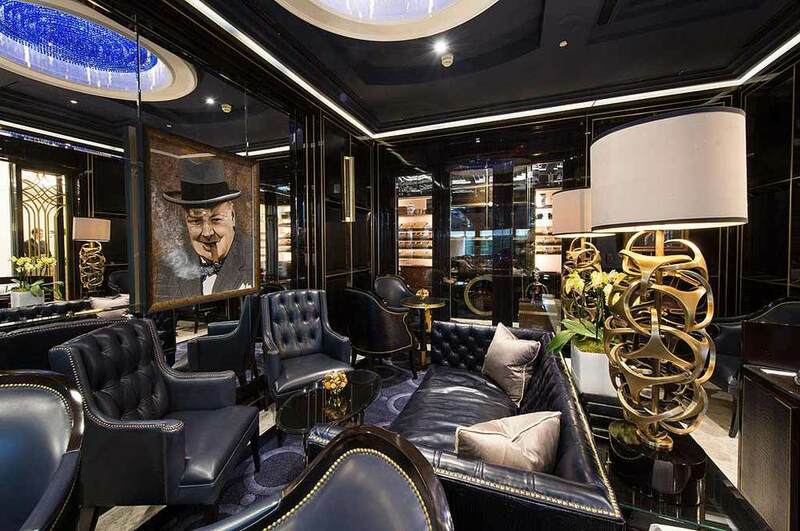 The Garden Room at The Lanesborough is the first and most luxurious Cigar lounge in Knightsbridge – a destination for cigar connoisseurs from around the world.